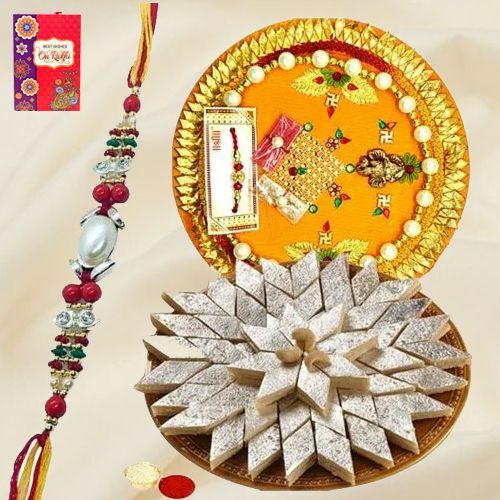 Render cherishable moments of Raksha Bandhan to the people you love by gifting them this Exotic Multicolored Rakhi with Kaju Katli Bites teamed with a magnificent Rakhi, Roli Tilak and Chawal free of cost. Adore your loving brother with this exotic surprising Gift of 7-8 inch. decorative Rakhi Thali followed by 250 gm. Haldiram Kaju Katli Sweets and paint a happy picture on his face.